Serve up all your favorite hot beverages in this Choice 8 oz. white paper hot cup! From hot cocoa and coffee to tea and warm cider, this Choice cup is an economical option for your cafe, coffee shop, kiosk, or concession stand. With a poly-coated inside, this cup resists condensation accumulation to protect the outside of the cup from weakening. Featuring a tightly rolled rim, this cup provides worry-free, leak-proof drinking and creates a tight and secure seal when used with a compatible drinking lid (sold separately). We use these for our small coffee and tea. They are perfect for someone looking for a quick drink. Good quality cup and a great price as well. Nothing wrong with them, work as intended. I would buy more next time because 50 doesn't last that long. Doesn't leak down the seam like other cheap cups do. These are perfect size for small gatherings, or children size drinks. They're a great in between size of sampler and regular drink. So far no leaks and they're reasonably priced. Excellent value for these disposable paper cups! Ideal for hot beverages, but would also recommend serving with a coffee sleeve. This is the size that I use for serving cappuccinos or short drinks, and hot chocolate. We've ordered these cups and use them as our smallest size of regular coffee/tea beverages in our coffee shop. They are a good cup, solid and sturdy. You'll want a hot sleeve for them depending on the style of drink you're doing. I used these for a coffee bar at my wedding. They were the perfect size. They did get a bit hot on the hand when holding, but that didn't seem to bother anyone. We use them all the time to give tea to the customer. Best price in the market and shipping is good too. They arrive the next day. We love Webstaurant! Great Study cups! We use them for both Hot and Cold Water cups for our restaurant. They are not flimsy, and do last a few uses per person. And the best part is that they're completely white! I think these do the job ok. Compared to the Solo brand, they are lacking a little bit, and I might not buy them in bigger sizes, but for a small cup of coffee they do the job! Use these cups for to go cappuccinos and hot chocolates for the kiddos. Java Jackets wont fit on these small cups, but it's usually not a problem. Perfect size and can go with any decor/theme. I use these with my hot beverage bars at events and have had no issues. I also buy the collars to make sure hands don't get burned. This is also very good choice for hot tea and even for caring cold drink. It serves really for big scale of service. The cup is well made. We love these cups. My only wish... isn't it possible to have the same lids as the larger size white poly paper hot cups? Not too big not too small, just the right size. The use I give to them is at events I serve charro beans in them. Ordered these for the coffee station at my wedding. I wish I didn't have to order 1,000 but it was worth it because I need 300 anyways. We use these cups everyday in our coffee shop. They are sturdy and work great with the coordinating lids. We will continue to buy these for the great price and quantity. This is a nice quality and sturdy to-go option for coffee. However, a cup jacket is needed for hot coffee...this cup gets too hot without a jacket. These cups are great and really hold up to holding the liquids without any spillage. Because they are paper be careful when pouring coffee because it will be hot! Great value for a very versatile cup, we use it for coffee, tea, hot chocolate, water, juice.... etc. this eight ounce cup is really convient to have for to go espresso shots. they are easy to store and stack as well. good for the price too. We used this for a wedding we catered and instead of using all decorative cups, we threw in some white cups and it worked out great. We used for a hot cocoa/cider/coffee bar and I would suggest getting the sleeves for the cups as they can get a little hot. I loved these cups! They were the perfect size and did not look cheap. We used them as water cups at the water station and they were great. These 8 oz. cups are the perfect size for our cappuccinos. They're durable, and cost effective, allowing us to serve our customers the best drinks at a good price point. We resisted having an 8oz beverage on our coffee truck menu for a while, but I am glad we started and got these cups. They're easy to use, keep beverages hot and free from leaks, and they're perfect for customers who just want a little beverage. Good quality cup, but they were taller and skinnier than expected. Not ideal for cappuccinos, but sufficiently held hot liquid and great for small or kid size portions. This is an incredible white poly paper cup that shoul never be associated with other cups. This is the best per cup price one can ever ask for. I use the 8 oz hot cups for small hot lattes. This is the perfect size for a single shot of espresso and frothed milk. We use these cups at the coffee shop for meeting or group events. Holds small amount of liquid, making it more cost efficient for events with more people. We used these at our wedding for our coffee bar. They were the perfect size for our needs! The price and quality are unbeatable! I will definitely be buying these again!! It is great to finally find white 8 oz drink cups. I prefer to give smaller size cups to avoid wastage and these just fit the bill. They are sturdy and look exceptionally good. These cups are a bit wider than the Dixie 8oz cups, so you will need the Choice lids as well. Outside of that, our baristas actually like the wider frame because it makes latte art a bit easier. Perfect for our coffee shop when making Cortados. Great quality and the white looks clean and classy. Would recommend to all coffee shops and bakeries. These white paper cups are great for holding and transporting hot liquids. This is a perfect size for a cup of tea on a work break. These are the best disposable cups for hot beverages. The are comfortable to hold and drink out of. 8oz is a perfect serving size amount. A nice plain, white paper hot cup that is great for our family get together parties. The eight ounce size is perfect for our kids' hot cocoa and is easy for them to handle. What can I say? It does its job. It is nice and sturdy and I never had an issue of the paper cup breaking or not holding up hot coffee and other beverages. Very satisfied with my purchase. These cups are very good for hot or cold use. We have used them with hot chocolate and for ice cream floats. The material is high quality and they are very durable. Good quality coffee cups that are nice but still affordable! The Choice lids fit these cups great. The cups do get very hot to the touch so be cautious. We use these 8 ounce cups for promotions or for catering. The only drawback is that if you put a hot drink in them you will need to use 2 of them or they will be too hot to hold. Choice 8oz white poly paper hot cups are the perfect size for a cup of coffee and are very classy. The quality is just outstanding. They don't melt and keep the liquids hot for a very long time. These 8 oz. white poly paper cups are a perfect size for hot teas. These cups are a must have for businesses in the winter! Our team always prefers to use white paper cups. These cups will work for hot and cold beverages. The white color allows us to stamp our logo on the side of the cup. These cups come in packs of 50. A great deal! We use the Choice 8 oz. White Poly Paper Hot Cup for Cappuccinos at our cafe. Like all choice hot cups they do the job very well! We use these 8oz cups for our small coffee and tea drinks. They are the perfect size for a small latte or cappuccino. The material is sturdy and reliable we haven't had any issues with it. These are great small cups for catering. When people order coffee for their office we send them with these 8oz cups and also for most other catering events that we do. Got this cup for our "cheap cup" of coffee but it has come in handy for so many things. It is your basic little white cup but a good quality general use cup that can be used for hot or cold beverages. We love Choice paper cups at our coffee parlor! This 8oz size is perfect for coffee or a cappuccino. It fits the 8oz lid perfectly. these cups were perfect for our hot coffee and tea for our event. For the price you can't get a great quality anywhere. I would recommend this to anyone with a small business or someone who is having a function that requires hot beverages. The 8oz size was perfect. These are pretty nice paper cups. Bright white design is customizable. They are more eco friendly than foam, have a nice rolled rim, and don't seem to leak. They are definitely hot to the touch though so you will need sleeves for your customers. At first we weren't sure if these cups would work for hot coffee or not, but we are very pleased to find out that they work just fine. They hold up very well with no sign of wilting under the heat of a hot beverage. We are also very pleased at the reasonable price. Thank you! This is a great sized cup to offer in your office at the coffee station for guests in a waiting room or in your lunch or break room. Love these little guys! We use them for our specialty drinks at the shop and they work great. We use black lids with these and they look adorable. Great buy! 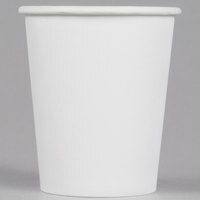 A nice plain, white paper hot cup by Choice that is perfect for our small coffees. The cups look great with our custom printed sleeves and making writing the customers' names easy. The Choice 8 oz. coffee cups are sturdy and great for crating. I like to decorate them with designer series papers, ribbon, burlap, stamped embellishments and a straw. Every I give them to my friends, I receive smiles and comments about how special the gift is. The cups hold a lot of treats, instant coffee packs and/or K-cups. I highly recommend both the cups and the black lids. We use these cups at our church to serve coffee on Sunday mornings. We love the size and the simple design. The paper is quality and the price is great. This paper cup is overall a good price and a good quality. You can look around and not find much better value out there anywhere. This a cup we use in memory care also for the residents that want water during the day. We go though a lot of this cup. The price is very good also. I drink coffee on my way to work and I love using these cups to put my drink in. With the lids on them I feel comfortable traveling over bumpy roads. Choice products are a great product for a great price. These are used for our kid sized beverages and small coffee beverages like cortados and macchiatos. The cups are great and hold up well. They keep our coffee hot and insulate well when used with sleeves. They are perfect for our church coffee area. The Choice 8 oz. White Poly Paper Hot Cups exceeded my expectations. I purchased for home use. Great for a quick cup of coffee. The quality is good as well as the price. Would definitely purchase again. I have multiple sizes of this cup for my coffee shop. It's priced better than anywhere else I've been able to find. Basic and good quality. These were bought for a hot coffee bar for a wedding, and they worked perfectly. Very easy to "customize" with stamps, markers, or paints. Good price as well. These definitely do the job! Whether your drink is hot or cold, they're a great size and very sturdy. No worrying about drinks leaking after sitting for several hours. Perfect size & great weight. We use these for our catering bakery business. Lots of brides who want coffee service or spiced hot chocolate for the kids. Not a flimsy cup - really don't need an extra sleeve - which saves on over all cost. Perfect size and perfect solid white. This is a good size for cappuccino and cortado coffees. We also use it for hot cocoa. The product is comparable in quality to all their other sizes. This is the 8 oz cup that we decided to use to serve our to-go cappuccino. We use a standard sized lid for the product. Nice. Cups. They. R good. For kids. Perfect. Size. And. Amount. They. Need you can give. Cold. Drinks. Or hot. Nice. Cup. Will buy. Again. They're convenient and portable--just the perfect size for the office or home and they save a lot of space stacked up. You can also write names on the outside and it doesn't bleed into the inside. These cups do a fine job. I won't give them a 5 star rating only because they didn't work with the existing lids I already had. As far hot cups go, they do exactly what you would expect of them. These cups are a great value for the product. I wasn't able to find a plain white hot cup at Sam's for weddings, but these were less expensive and better than a local product. Great price, great quality. I love the price especially because they are so much cheaper than my local restaurant supply stores and I can choose the specific size I want! The cups are great for serving our cappuccinos. They are sturdy, don't leak and are always a reliable purchase. Definitely will be reordering these cups. These little 8 oz. cups are a perfect size for kids hot cocoa and apple cider. They also work for small or mini sized coffee cups. Just the right size for after meal coffee time. The paper is thick and high quality for the price. Will be buying more in the future for parties. These Choice Hot Paper Cups are insulated and perfect for smaller volume takeaways. The plain outer layer supports easy branding with stickers, printing and identifying customers. This is the perfect size for a real cappuccino, It has the right about of room for the espresso and milk needed to make it right. Awesome cups that we use solely for daily water cups. We were going through many dishes on a daily basis with the kids messing up cups. These have helped eliminate wastes and extra costs. They are more than enough to provide nourishment and they hold up well over the course of a day! Used the Choice 8 oz. White Poly Paper Hot Cup - 50 / Pack to hold a kiwi strawberry fruit juice cocktail. So refreshing and such a nice portion of 8oz drink of strawberry. Very fast shipping. Great economical choice and have held up well for us. We mix different types of ice cream combinations in them. 8oz makes a perfect child/small size. Awesome tea and coffee cups for our small coffee station in our restaurant. These poly cups are strong and has been durable for our customers. Great size cup for our cappuccinos and other hot beverages. The cup does get a little soft after sitting for a while with a hot beverage in it. These cups are great. For the price, you cannot beat them. I have looked around, and settled on these and I am so glad I did. The 8 oz. cups are sturdy and they are exactly what I need for my coffee shop. I wanted reduce the cost of disposable products, so I decided to purchase these cheap paper cups. I am okay with the quality. I left hot water in the cup for hours but it did not leak. At first, it was a little bit moist on the surface of the cup but it didn't soak or leak. The bottom did get bloated but it didn't bother me too much. I definitely need to have cup sleeves for these cups. Cups get so hot on the surface as soon as you pour hot water into it. I am keeping them. Most people use these cups to drink from. I use them as tomato and pepper seedling transplant cups. I absolutely love them for this purpose. They work especially well since they don't have a waxy coating that is loathe to decompose. I can label my transplants for my friends and customers. Our clients like this product because they remind them of big chain cups. Often times they get decorated sleeves or decorate the cups themselves! Great product. These little cups are perfect for small cups of tea or hot chocolate. They are very durable feeling and they are such a great price! These cups were a great size and weight for oatmeal cups at a recent catering. They were sturdy and as shown in the pictures. I would recommend them and purchase again. I've been using these cups for a bit now and have had no issues at all. They seem to be a quality product and well worth the price. I would, however, recommend avoiding the matching lids and going with the solo version. Great size for a TOGO cappuccino. Too many shops make the caps in the giant 12oz cups but this get's the proportions right. Price is reasonable for the 50 pack. These cups look really great; they are simple, very clean, and nice looking. We will be serving coffee in them at our wedding in August. This cup is great. I use it for coffee and hot chocolate and it maintains the coffee hot for a reasonable time. Specially with the lid on, I bought item # 999L8B for it. As you can see in the picture I used air brush and a template to decorate it, nice for that too. I bought this cup to decorate it and give it as gift with candies inside. A great all around good cup to have for Hot or Cold beverages for your to go customers at cafes. I use a lot of these. These 8 ounce paper hot cups are perfect for those with a smaller coffee addiction. The only bummer for us is that the sleeves we bought to use on our cups don't work on these. These paper coffee cups are simple and great quality. Not like the cheap flimsy foam cups where the bottom will pop out due to heat. These will keep yorr beverage hot for a long time. USed these at a wedding for soup. They are heavy duty. Didn't need any cup sleeves as these cups retain the heat on the inside. Great cups for serving hot coffee. They look good, are priced well, and get the job done when we're selling coffee at a Farmers Market. We have had a problem with a few that their manufactured size is ever so slightly smaller than usual. With this issue, the lids do not form such a tight seal. These are perfect for the coffee bar for my wedding but the sleeves we bought were too big. I would recommend getting the bigger cups if you also want to order the sleeves to go on them. But I love that they are plain, so people can write their names on them. Great value for brides on a budget! The cups are in quality exactly what I was looking for and fit the description. When ordering sleeves, though, they did not fit these smaller cups. these little guys are quite sturdy and very versatile. we use these for capp's and use them for mxing up iced coffee drinks. when full, they pour right over a glass of ice. neat little cup! Great cup. Perfect for cappuccinos and other small drinks. Generally hold up well, but we've found that some leak at the seams a little bit. Not great for refills. These paper cups are exactly what we wanted for our free coffee station at our church. We actually stamp them by hand with our logo and they look amazing! Would definitely recommend these cups. The Choice 8 oz. hot paper cups have a nice clean appearance. We appreciate the quality and price of the cups. The fact that they are BPA free is important to us for health purposes and we use them to serve freshly brewed organic coffees. It was nice to be able to order them by the sleeve rather than a case at a time. We used these cups at a city wide event this past December, where we set up a tent and sold freshly brewed organic coffee and baked goods. Nice size to use at events and Farmer's Markets. Would recommend. To get so many cups at such a great price is a huge help to our small, nonprofit studio. We were spending too much buying separate cold and hot cups and, now that tea season has arrived, we go through so many cups that this option is ideal. They're durable, sturdy cups for a bargain price. We have been ordering these paper hot cups for over a year. These cups are economical and really do the job for our members. I love that we get them super fast too! We have used these cups for both hot and cold beverages. They hold up well for both. The cups can be re-used multiple times during an event without leaks. I started buying these for my workplace and everyone loved them instead of the cheaper ones the company was buying. Now because everyone loved them, the company buys them for us! These cups help up very well, they hold just enough liquid, but not too much. We paired these with the eco sleeves and were very pleased. We use a rubber stamp to brand these and send them along with our coffee totes. Do be aware that these cups can get warm, so I always serve them with a napkin. These are well priced and I use the cups beyond drinks. Sometimes we store short-term salt and different ingredients in them. Very reasonable pricing - need to double cup or add a sleeve for hot drinks. These cups are strong and sturdy, but be aware that they are too small for use with a standard drink sleeve. I didn't pay attention to the measurement and they were a bit too small to work with the sleeves I bought on here. But they still worked great as cold drink cups! In my business, I vastly prefer to use paper products instead of plasic or styrofoam whenever possible. These are good, sturdy cups, fine for hot or cold beverages. I appreciate the ability to purchase them in sleeves of 50.